Wallace D. Waddles, author of The Science of Getting Rich, understood that to harness the power or your mind to manifest your success you needed to know how to use the will. In my previous videos, I’ve covered some of the principles he outlines needed to attain that success. In Part 5, How to Use the Will, I cover the important principle of using your will. To set about getting rich in a scientific way, you do not try to apply your will power to anything outside of yourself. Wallace says it’s wrong to apply your will to other people to get them to do what you wish. Do not to use your will power upon another person…….. even for his own good. The Science of Getting Rich does not require you to apply power or force to any other person. You do not need to apply your will to things, in order to compel things to come to you. The Substance, Wallace explains, is friendly to you and is more anxious to give you what you want…. than you are to get it! To get rich, you need only to use your will power upon yourself. When you know what to think and do, then you must use your will to compel yourself to think and do the right things. That is the legitimate use of the will in getting what you want. To use it in holding yourself to the right course. Use your will to keep yourself thinking and acting in the Certain Way. Use your mind to form a mental image of what you want and hold that vision with your faith and purpose and use your will to keep you mind working in the Right Way. The more steady and continuous your faith, the more rapidly you will get rich because you will make only Positive impressions upon Substance. As this impression spreads all things are set moving toward it’s realization. Every living thing every inanimate thing, are stirred toward bringing into being that which you want. All forces begin to be exerted toward bringing into being that which you want. You can stop all of this by starting a negative impression in the Formless substance. Doubt or unbelief is as certain to start a movement away from you as faith and purpose are to start one toward you. If you want to get rich you must not make a study of poverty. Things are not brought into being by thinking about their opposites. Wallace says, Get rich; that is the best way you can help the poor. Don’t fill you mind with pictures of poverty…….. use your will to keep your mind and faith fully on your desired outcome. You can become right by creation, not by competition. Every man who gets rich by creation opens a way for thousands like him to follow and inspires them to do so. Use your will power to keep your mind off poverty and keep it fixed with faith and purpose on the vision of what you want. 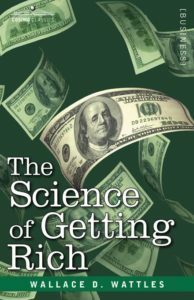 There is more information on the use of your will to achieve your goals in our part 6 of Wallace D. Waddle’s book The Science of Getting Rich. This entry was posted in Uncategorized and tagged Carole Dean, manifesting, The Science of Getting Rich, wallace d. wattles by Richard Kaufman. Bookmark the permalink.